Iranian exiles Icy and Sot brought together the two communities they know best by organizing two simultaneous gallery openings on Friday night, one in Brooklyn featuring 10 Iranian street artists and the other in Tehran, showcasing 35 NYC-based graffiti artists. Last weekend, as promised, the owners of Manhattan Avenue bars Matchless and No Name reopened the Park Luncheonette off of McCarren Park. You can now stop by in the morning for espresso drinks and maybe some banana bread, or in the evening for beer, wine or cocktails at the candlelit bar (there’s also root beer on tap). The pizza menu didn’t debut this past week as hoped, but we’re told slices should be flying out of the takeout window by next week. We spoke to Nicholas Schneider, who’s heading the pizza operation, and his partner Ted Nugent of No Name and Matchless. 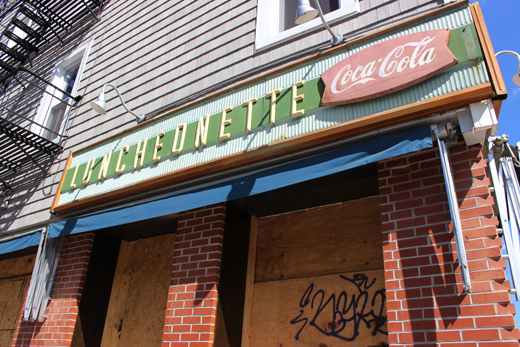 Play the audio slideshow to check out the luncheonette’s new look and hear more about what to expect from the kitchen. Greenpoint’s Park Luncheonette on Driggs Avenue, right across from McCarren Park, had a history of being the classic American food spot before it closed down four years ago. Now the team behind Matchless and No Name is reopening the place as of this Saturday. It will maintain the traditional diner feel with some twists: open 24 hours, bar service, and a pizza slice window on the Lorimer Street side.